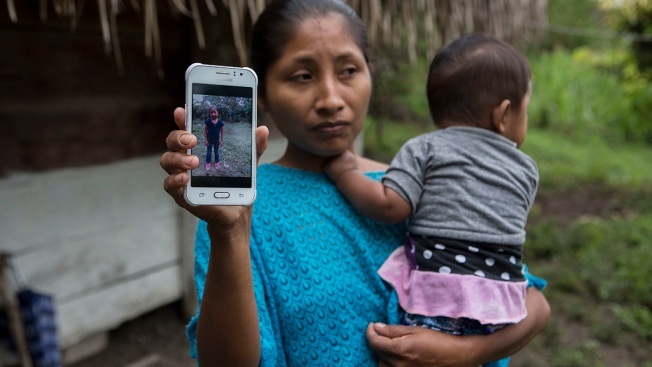 Claudia Maquin, 27, shows a photo of her daughter, Jakelin Amei Rosmery Caal Maquin in Raxruha, Guatemala, on Dec. 15, 2018. Lawmakers visiting the Border Patrol station where a 7-year-old Guatemalan girl was taken hours before her death demanded an independent investigation Tuesday into the response by federal agents. "There are things that we need to learn," said U.S. Rep. Raul Ruiz, a California Democrat who was part of the delegation visiting the Border Patrol station in Lordsburg, New Mexico. Ruiz, a doctor, questioned why border agents didn't call for an immediate airlift of Jakelin Caal after her father told an agent she was sick and vomiting. A bus carrying the child and her father left the Antelope Wells port of entry for the Lordsburg station, roughly 90 minutes away. By then, according to a Customs and Border Protection statement, Jakelin's temperature had reached 105.7 degrees Fahrenheit (40.9 degrees Celsius). Emergency medical technicians had to revive her. She was then airlifted to an El Paso, Texas, hospital, where she died the next day. The girl and her father were traveling with a group of 163 people when they arrived at the border. U.S. government officials say Jakelin had not had anything to eat or drink for days, which lawyers for her family have disputed. Members of the Congressional Hispanic Caucus visited both the port of entry and the Lordsburg station. Jakelin and her father were first processed at Antelope Wells. U.S. Rep. Ben Ray Lujan, a New Mexico Democrat, said the station had just two portable toilets, no running water, and "inhumane holding cells" holding adults and children together. Ruiz said a "cursory medical examination" should have revealed if Jakelin had a high pulse or a fever. "In the process of upholding our laws and processing our laws, we can't lose our humanity," he said. CBP said in a statement Tuesday that it "will review the incident operationally to learn from this tragedy." The inspector general of CBP's parent agency, the Department of Homeland Security, has said it will investigate Jakelin's death.